Teeth are often restored with fillings of silver amalgam or composite plastics. These materials can often accomplish the aim of replacing the part of the tooth that has been lost in a strong and good-looking manner. However, there comes a point where the damage to the tooth has removed too much structure to hold a filling or the tooth is cracked. The restoration must be done with the use of a dental crown. This dental restoration technique involves using a tooth-like covering or "cap" that is placed over a carefully prepared existing tooth, to strengthen, restore or improve the appearance of your natural tooth. Crowns are a type of dental restoration which, when cemented into place, fully cup over the portion of a tooth which lies at and above the gum line. In comparison, fillings are dental restorations that are used to fill in or cover over just a portion of a tooth. Since dental crowns encase the entire visible aspect of a tooth, a dental crown in effect becomes the tooth's new outer surface. 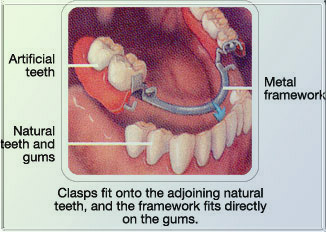 Conceivably the placement of a dental filling could, as an alternative, be used as a means to restore a tooth's shape. Dental crowns however offer a big advantage to your dentist over dental fillings by way of the fact that they are fabricated "away from your mouth". By this we simply mean that dental crowns are fabricated in a dental laboratory (by a dental technician who uses plaster molds your teeth made by your dentist). Dental fillings, in comparison, are created "in your mouth" by way of your dentist placing the filling material directly upon your tooth. When a dental crown is made the dental laboratory technician can visualize and examine all aspects of your bite and jaw movements, from a variety of angles, and sculpt your dental crown so it has the perfect anatomy. In some cases this anatomy will be even more ideal than your tooth's original shape. When placing a dental filling a dentist has less control over the final outcome of the shape of your tooth because it is often difficult for them to visualize, evaluate, and access to the tooth on which they are working. Since dental crowns cup over teeth, any dental crown that has a porcelain surface can be used as a way to idealize the cosmetic appearance of a tooth. Possibly you have heard it said (especially in past decades) that such-and-such movie star has had their teeth "capped" (the term "cap" used here is equivalent to the term "dental crown"). This simply means that the person has obtained their "Hollywood smile" by way of having dental crowns placed. Actually, getting your teeth "capped" so just to improve their appearance can at times be a very poor choice. Dental crowns are best utilized as a way to improve the cosmetic appearance of a tooth when the crown simultaneously serves other purposes also, such as restoring a tooth to its original shape (repairing a broken tooth) or strengthening a tooth (covering over a tooth which has an excessively large filling).